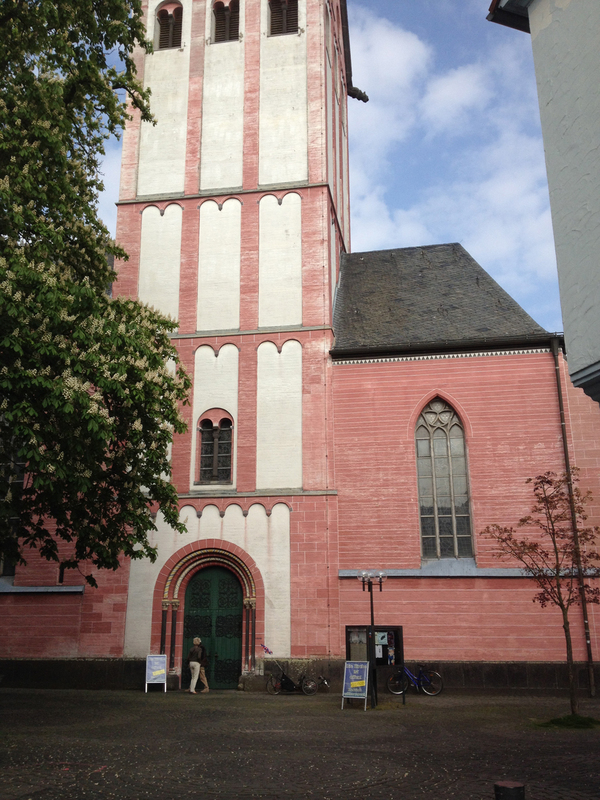 One of my challenges for my year (or more) in Germany is to cycle to all the churches in Kreis Viersen. So with an area of 570 square kilometres which makes it 1/37th of the size of Wales or the same size as 78,820 football pitches (two random measurement units often found in the UK media – I couldn’t find out how many Double Decker Buses would fit in a square kilometre, unfortunately) it’s a reasonably large area. 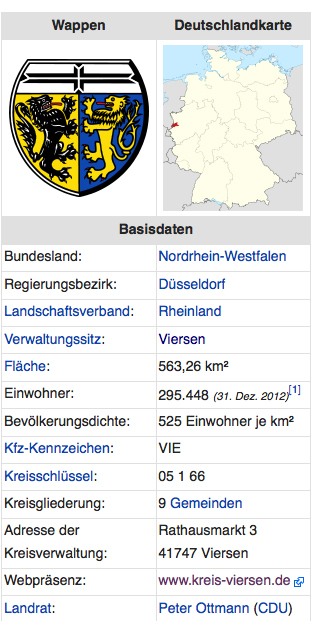 Kempen is also right at the top right hand side of Viersen so I would be ranging a reasonable distance to visit churches on the bottom left hand side, roughly 36km or 22 miles. 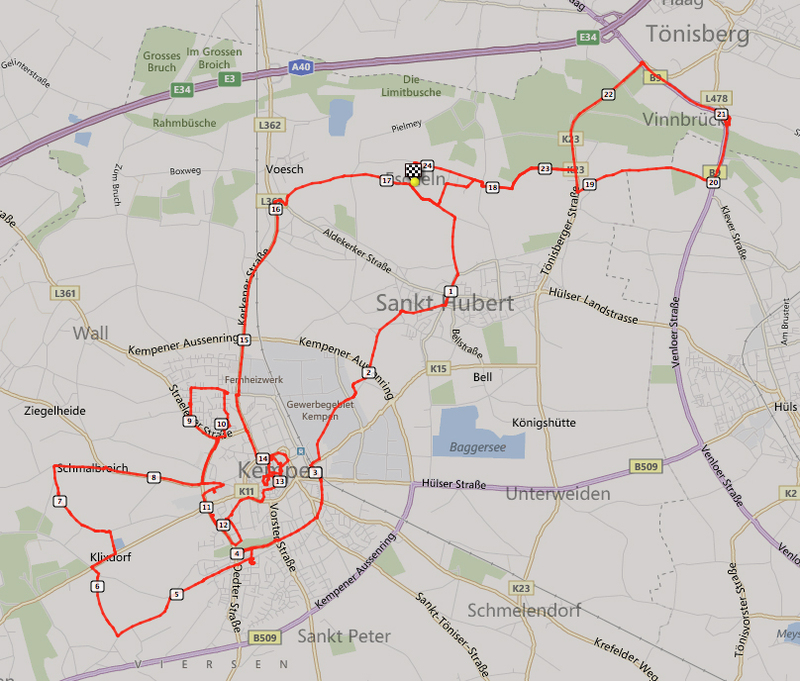 Here is the map of Kreis Viersen (roughly). Click to enlarge. I have made a Google Map with all the churches (that I have so far identified) marked on it – red if I haven’t yet visited them, green stars if I have been outside them and purple diamond if I have attended a service there. As there are rather a lot of churches to visit I thought I’d break up my reports into batches of 10. I am not planning to visit the churches in any particular order, I’ll just visit whichever ones I am passing or that take my fancy one day. I have all 112 as waypoints on my bike’s Garmin so can see when I am passing reasonably near to them and can divert a little. The church is situated in a residential street on the western outer edge of the village of St Hubert. 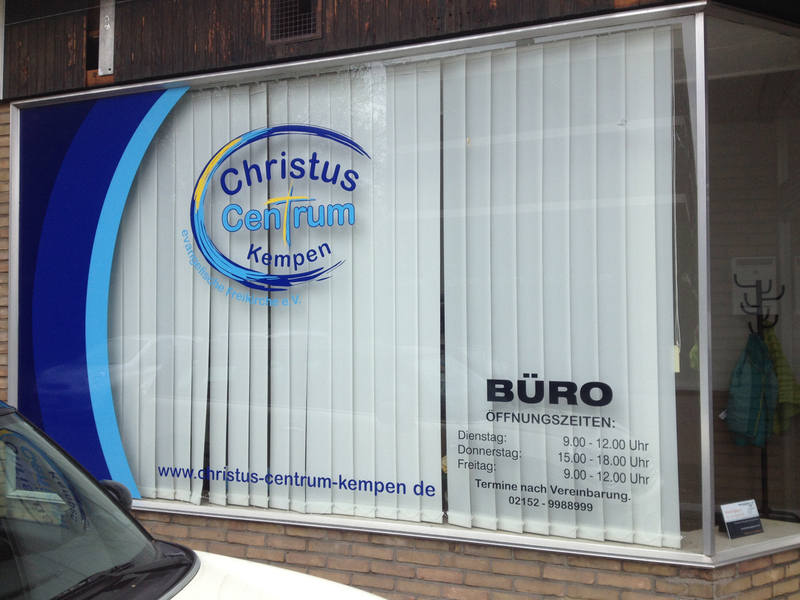 It is the church that I have been attending as a ‘regular punter’ since I arrived in Kempen. 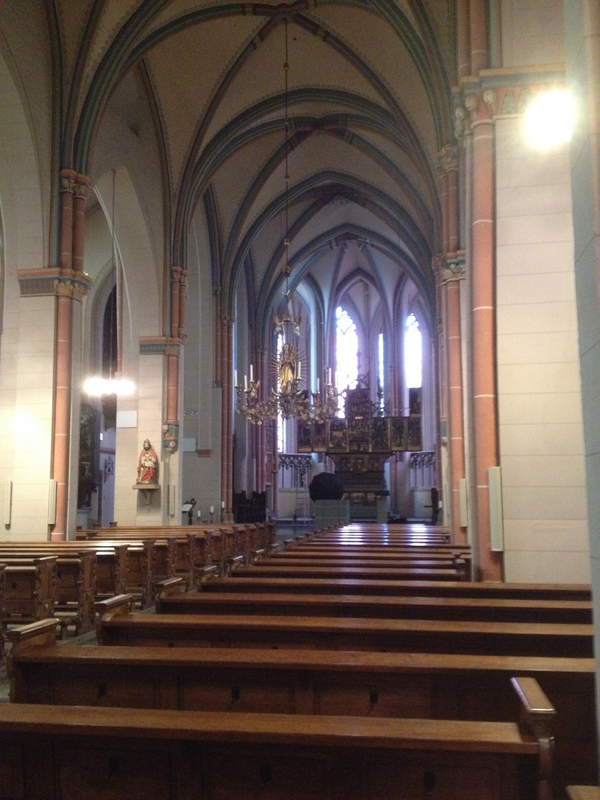 This is a small wooden church but with a lot of rooms behind in which the choir, for example, practice. The bell is not in the bell tower but on the ground outside the front of the church. It is rung during the Lord’s Prayer and at other times (during confirmations), as well as before the service. 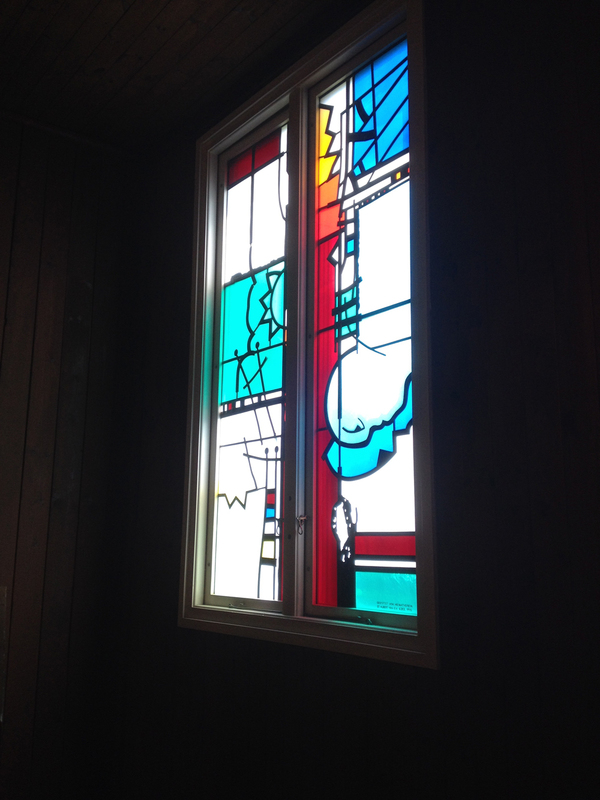 There are some rather lovely stained glass windows inside. The history of the church was briefly explained to me by a parishioner. 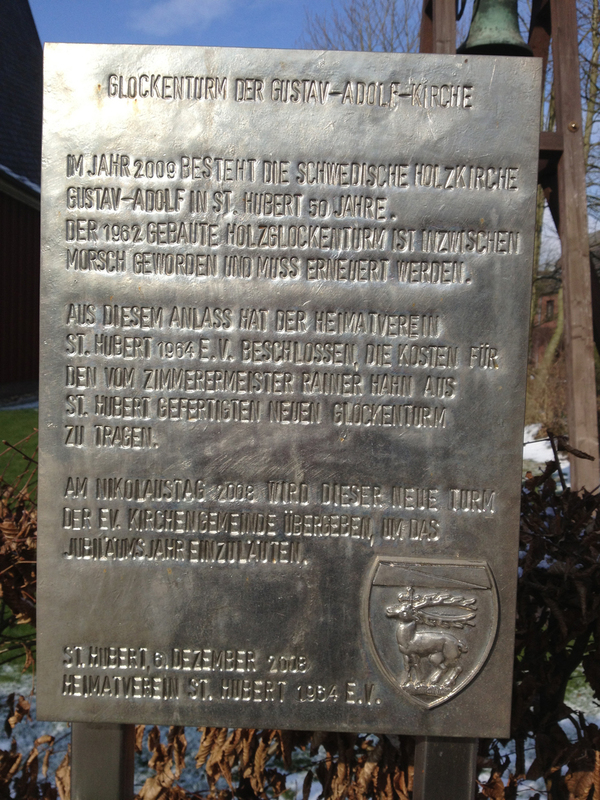 She said that originally St Hubert only had a catholic church and the protestants in the village had to go to the Thomaskirche in Kempen, two miles away. There wasn’t a lot of money amongst the parishioners so they didn’t think they could build a church. 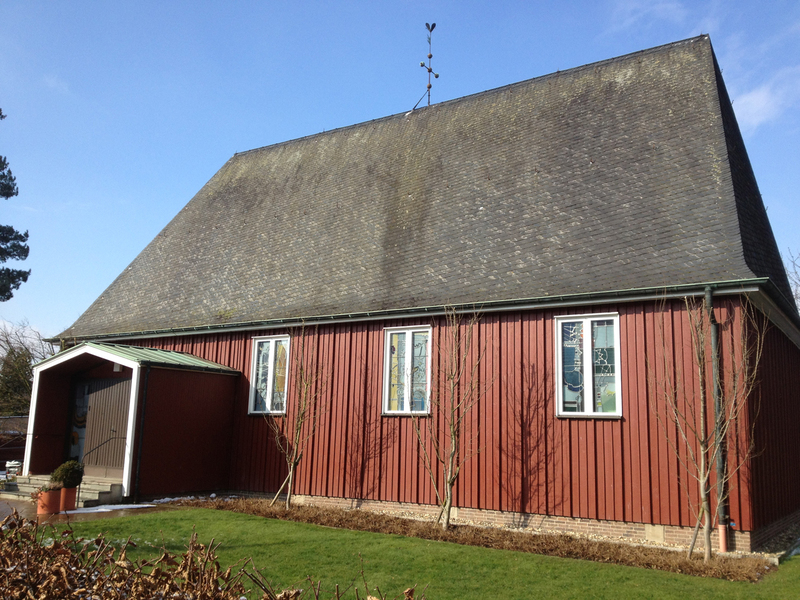 However, a businessman in Sweden offered to pay for all the wood to build the church and to send over some local builders to construct it and so the church was built. 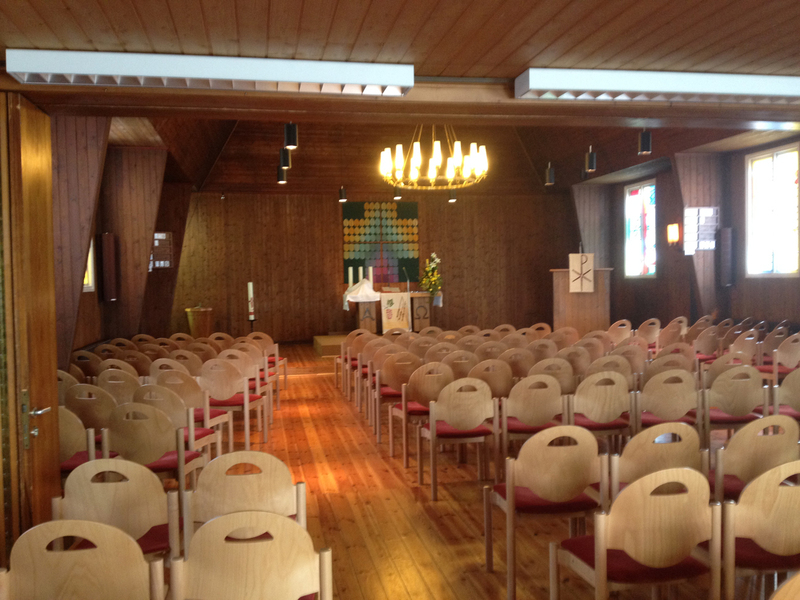 The interior of the church is (not unsurprisingly) generally of wood with a corresponding dry acoustic for the singing. 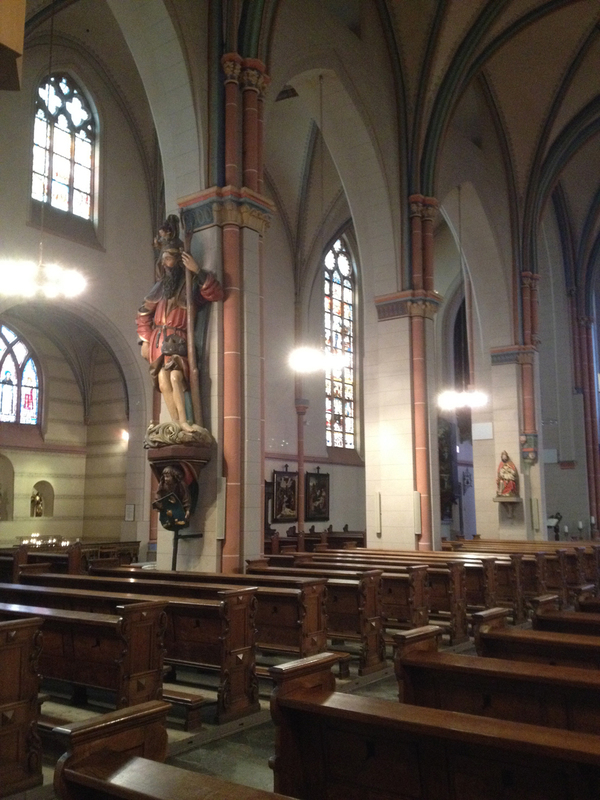 The chairs looked fairly new and were of a different, light wood and were reasonably comfortable – always important in German churches where you seem to sit for quite a long time (they don’t stand up to sing hymns). The organ, which seemed quite decent, is seven years old and has two manuals and the church is very proud of the fundraising which enabled them to build it. It’s a very friendly community and they seem to have welcomed me. I’ve been to a communion service and a confirmation service already and it seems they have a lot going on within the community – they also hire out their rooms to the local catholic church (much larger) when they have special events such as First Communions and need more rooms for the after-event parties! Members of the Da Capo Choir, with whom I sing, sometimes sing for services at this church; several attend the Catholic church in St Hubert so it’s nice to see people visiting each others’ churches. It’s one I’ve cycled past many times as it’s on the old Bahn Radweg (railway cycle route) which goes from Nettetal-Lobberich to Kempen. There was originally a church on this site in 1970 but it was a prefabricated building and in not very good repair with some structural defects so the diocese decided to build a new church, parish hall and office area. The church was consecrated in 1990. The architecture consists of a mainly polygonal structure with lots of nested spaces under one tent roof. The centre of the building is dominated by the 38 metre high tower. The church is roofed with lead and has some attractive stained-glass windows created by the artist Josef Ebnöther. 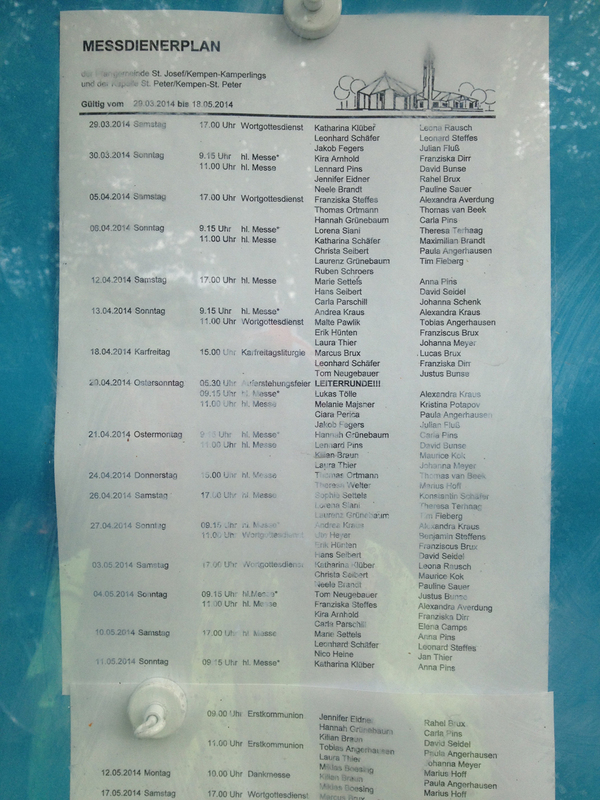 The noticeboard showed that they have quite a lot going on – I wasn’t surprised as I saw several people going into the church despite me visiting on a weekday. The church is located right in the middle of a housing area and I liked its overall design and position – the tower is visible from the Bahnradweg although you can’t see the rest of the church due to all the foliage around. 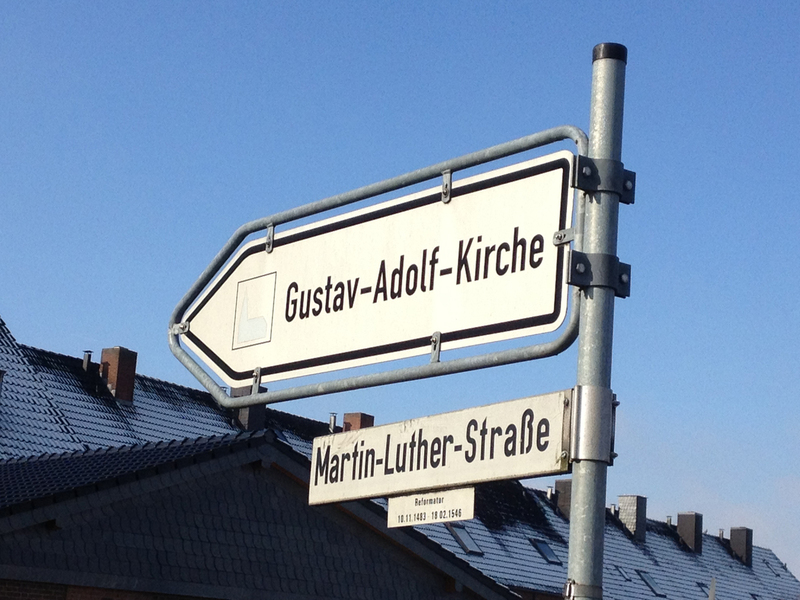 I had looked at this church’s website before I moved to Germany and had downloaded a couple of their podcasts of sermons to see what they were like. They seemed most like some of the more charismatic evangelical free churches in the UK and their style isn’t something I like (nor, do I imagine, we would agree much on theology). 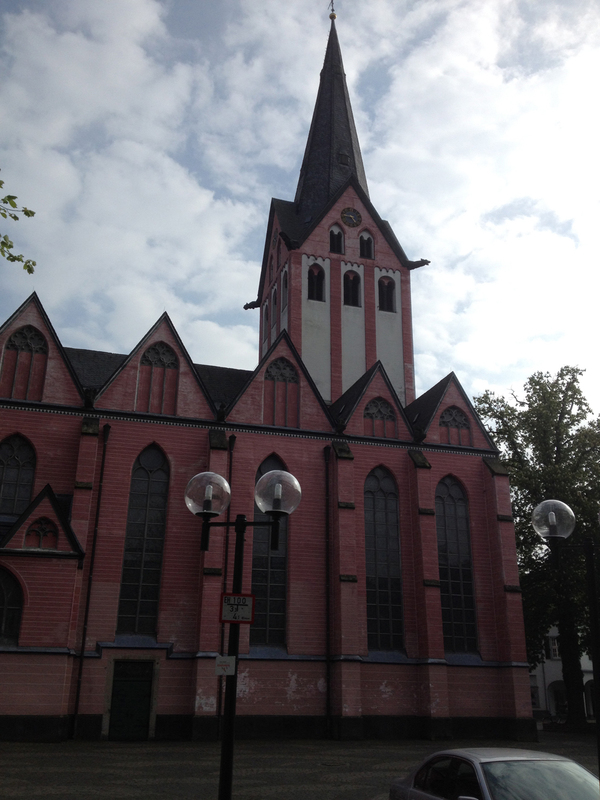 However I was interested to see that there are some of the newer churches in Germany and it’s not just the traditional Catholic and Protestant churches in Kempen. I initially cycled past the building. I’m not sure what I was expecting but it looked just like a car tyre shop or some other basic shop front. I had arrived outside of their office opening times and there wasn’t much to see so I headed off to the next church, just around the corner. 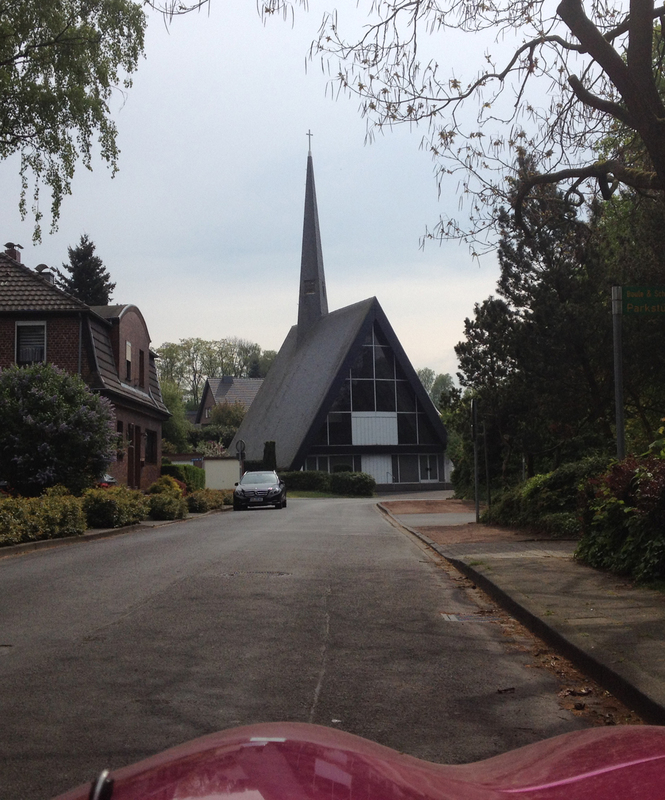 This is another catholic church in Kempen affiliated to the main group (Mariae Geburt). 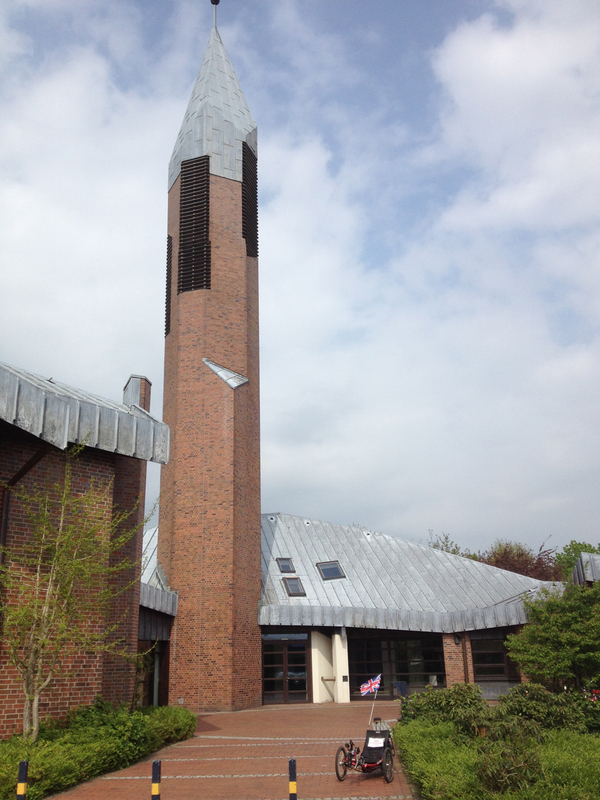 It was built in 1968 when Kempen the town had expanded to the north and it was felt that a new church was needed to serve the people there. Unfortunately some major structural problems with the building were discovered in the mid 1980s and it had to be rebuilt. The new church was consecrated in 1993. 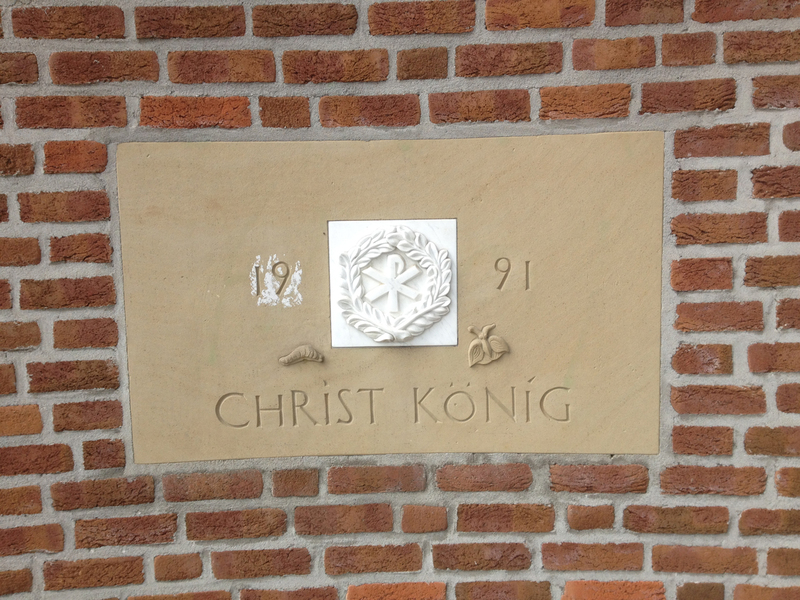 The main idea of the church is “The King Jesus Christ rules through service”. The symbolism is in the address, Concordienplatz (place of concord) which faces the King’s Wall. The interlocking of the church and the secular area (which has some shops) is another part of the theme of this parish. I was rather disappointed that the church was shut as I had hoped to get a look from inside at these windows – I think they would be quite impressive. 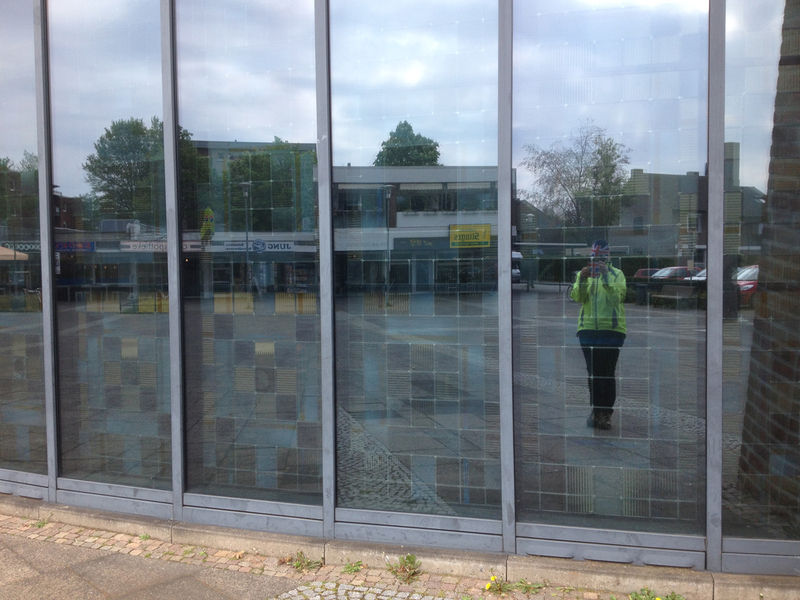 Instead you can see me with the shops reflected behind. It took me a little longer to find this church than I expected as I cycled straight past it – it looked rather like the houses that surrounded it. 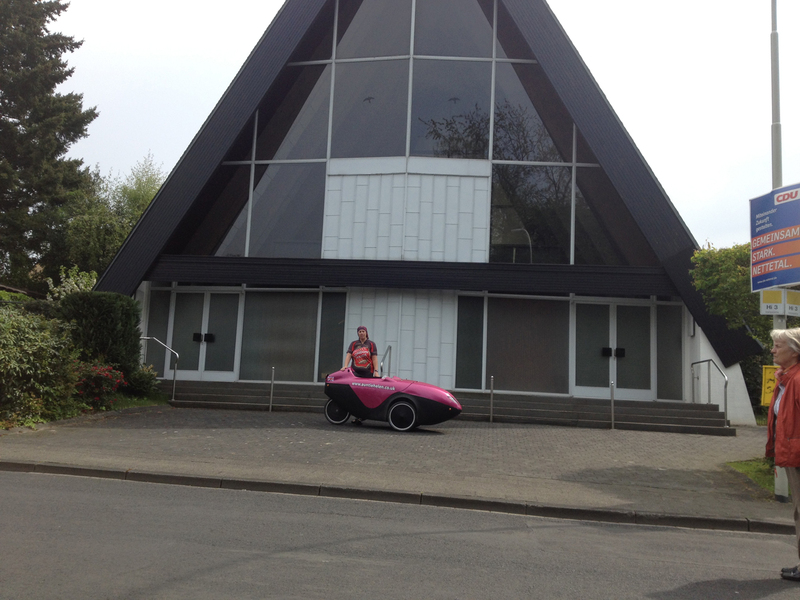 I had seen a NAK church before in Falkensee near Berlin and a friend there had mentioned that they are a cult. I know very little about them but there’s a fairly extensive Wikipedia article which gives more information. Full marks to this church for having such an excellently long name, having the road it sits on named after it and – best of all – for being open when I visited on a weekday. 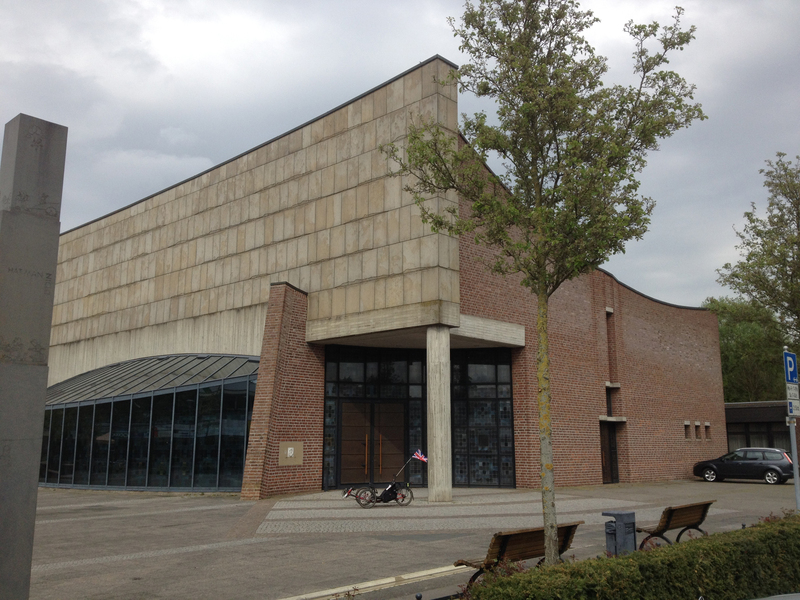 It’s such a large building and in the middle of the fairly densely-packed centre of Kempen that I couldn’t get a picture with the whole church in the frame. 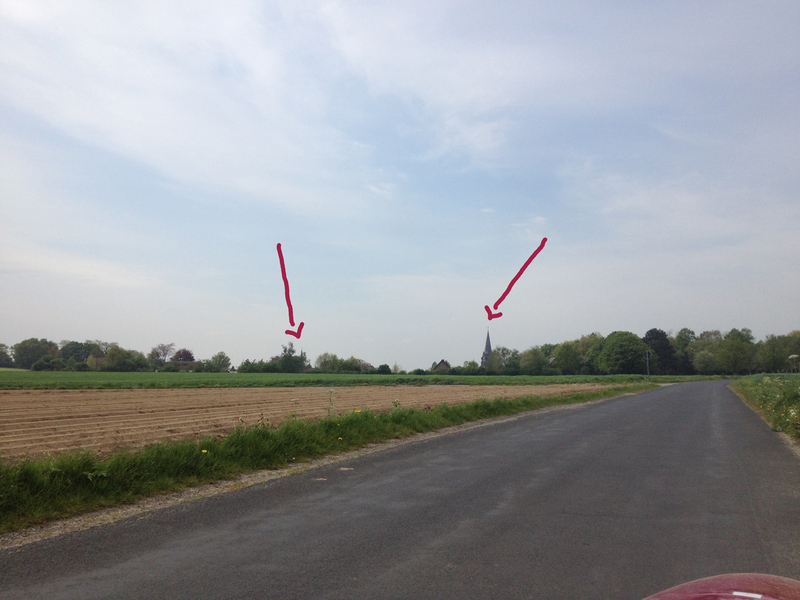 From outside Kempen, as you approach on some of the main roads in, it’s clearly obvious as the highest point for a few miles around. 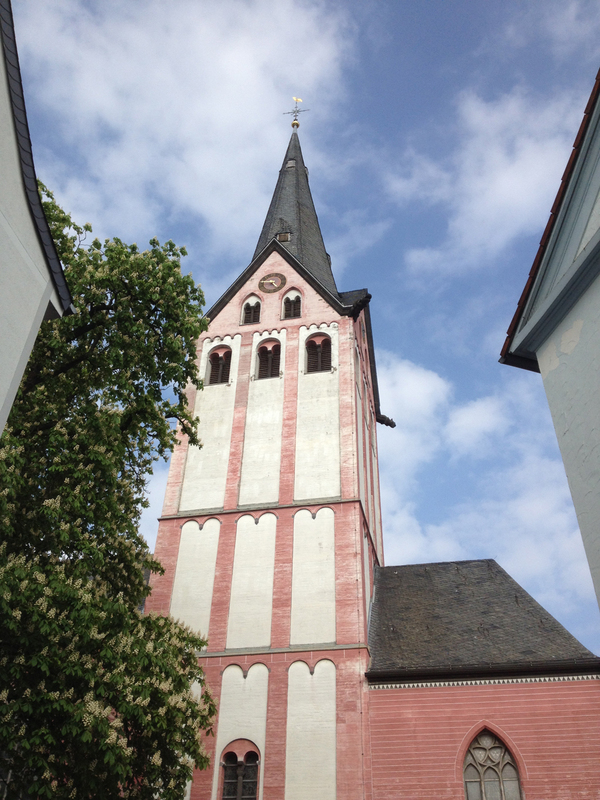 I like that aspect of towns and villages in this part of Germany – the churches are what you can see. 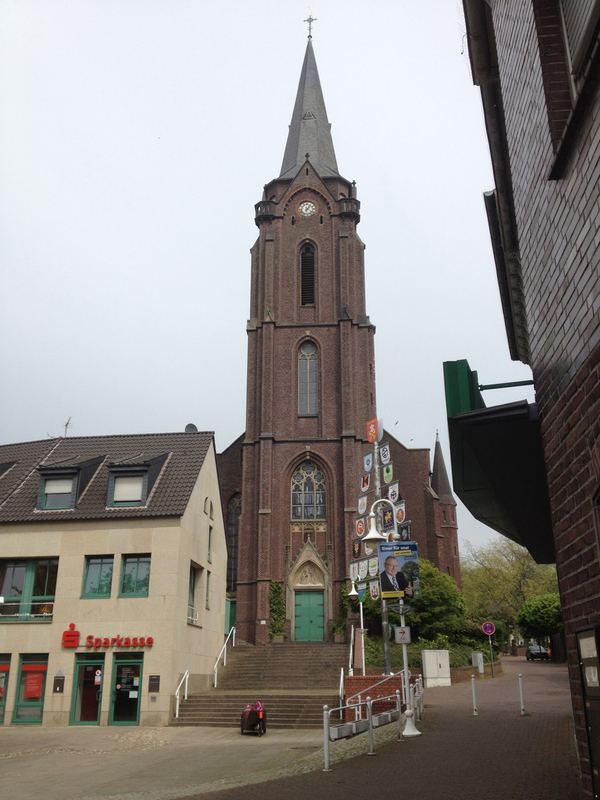 This is the main Catholic church in Kempen and the other Catholic churches are linked to it. Almost all the other churches I’ve visited so far have been under 100 years old but this one is rather older – the original foundation stone was laid in 1200. The original small brick church had various additions in the 14th and 15th centuries, as well as a Lady Chapel built in the north aisle. Kempen was a place of pilgrimage and received a large influx of pilgrims until the growing importance of the Kevelaer Pilgrimage route reduced its popularity. In 1490 the present church was completed. Shortly before the end of World War 2 the church was badly damaged in a bombing raid. Fortunately the works of art and altars had been relocated or protected and so they were preserved. Restoration of the church took five years and it has had subsequent renovation work from 1980 to 1993. I gather that they have a decent organ here and have some organ concerts and other music so I expect I will be visiting before too long for some cultural music! I did cycle to this church and was able to get in and have a look around but this was because I combined my church visit with a choir practice at this very church. 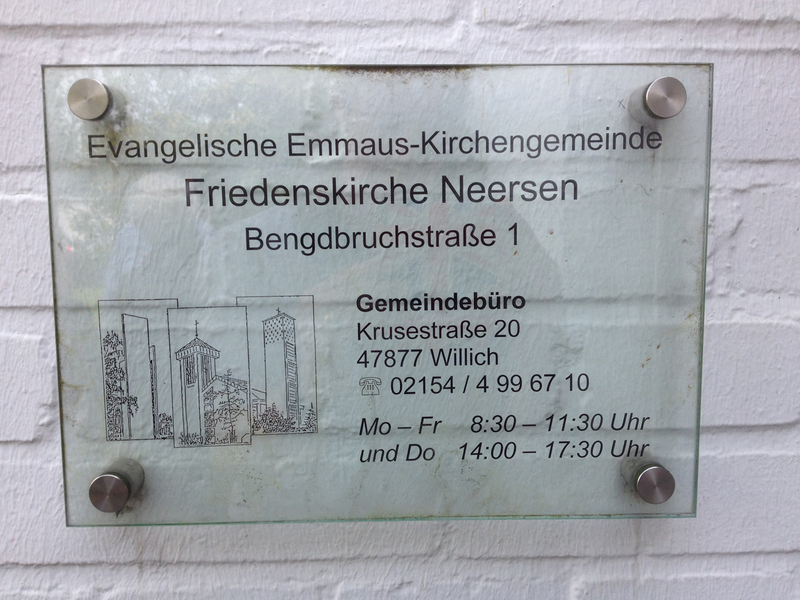 The Friedenskirche is a member of the Evangelische Emmaus-Kirchengemeinde, a group of three Protestant churches in Willich. We will be having our choir practices in all three. 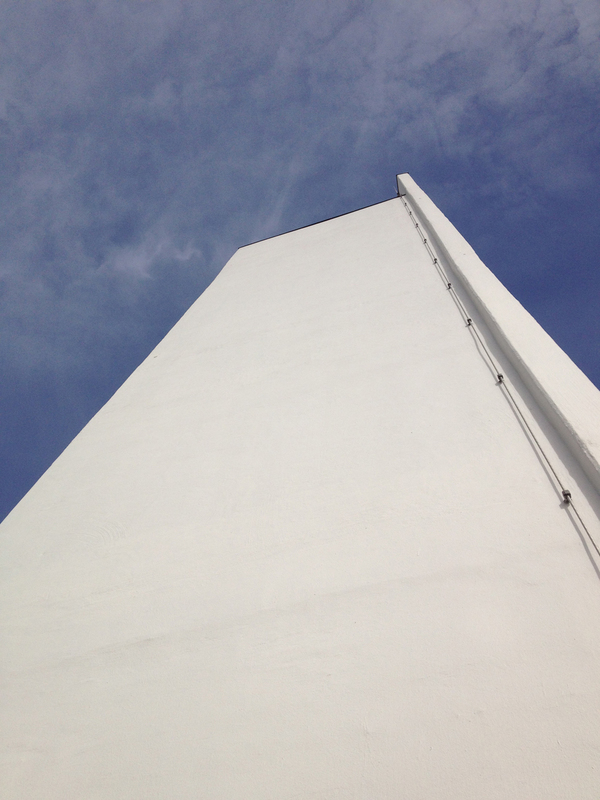 It is another church of the rather concrete-and-sharp-angles school of design. 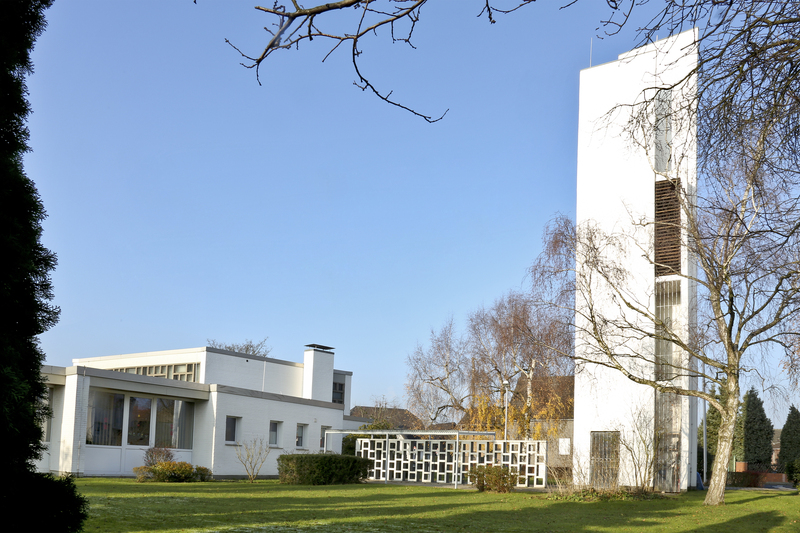 There are few old protestant churches in this part of Nordrhein-Westfalen, it seems, and the 60s architecture can be a bit hard on the eyes. We were there on quite a warm day and I was consequently wearing summer clothing. 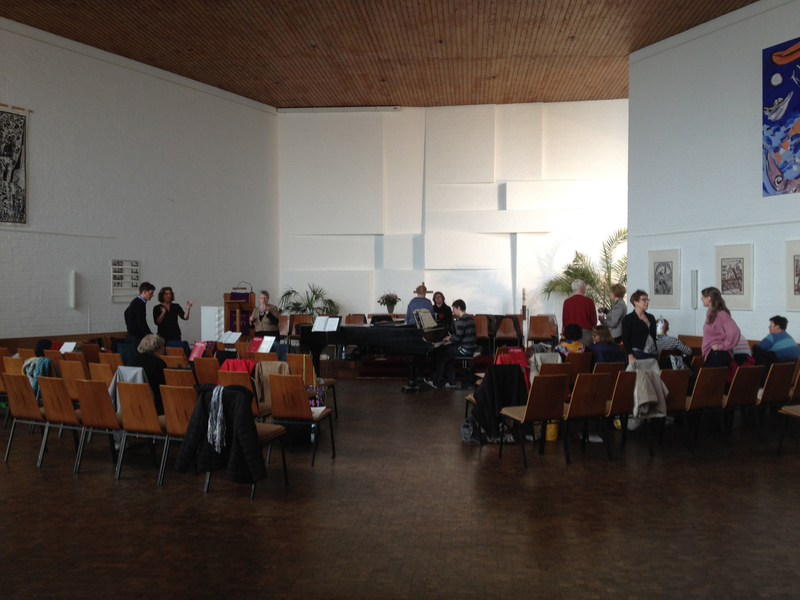 Everyone else had jumpers and scarves when they arrived – it turns out the church is usually freezing. However something was clearly wrong with the heating as it was at 24 degrees and everyone was roasting – except me! The Pfarrer appeared to see if he could fix the heating and he turned out to be surprisingly dishy; I may visit again! 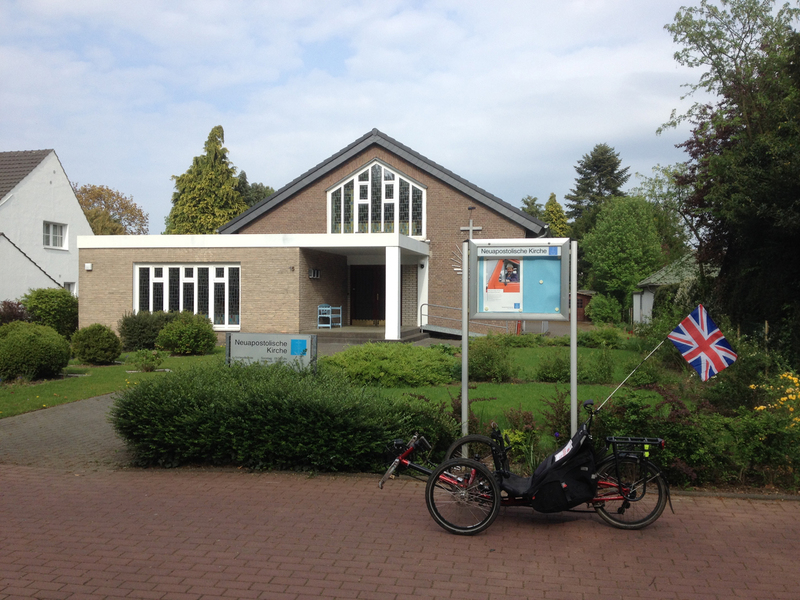 I have cycled past this church what feels like dozens of times over the last couple of years as whenever I have holidayed in Niederrhein (and I have stayed here three times) I have used local GPS tracks for good cycle routes and most of them go past Abtei Mariendonk at some point. 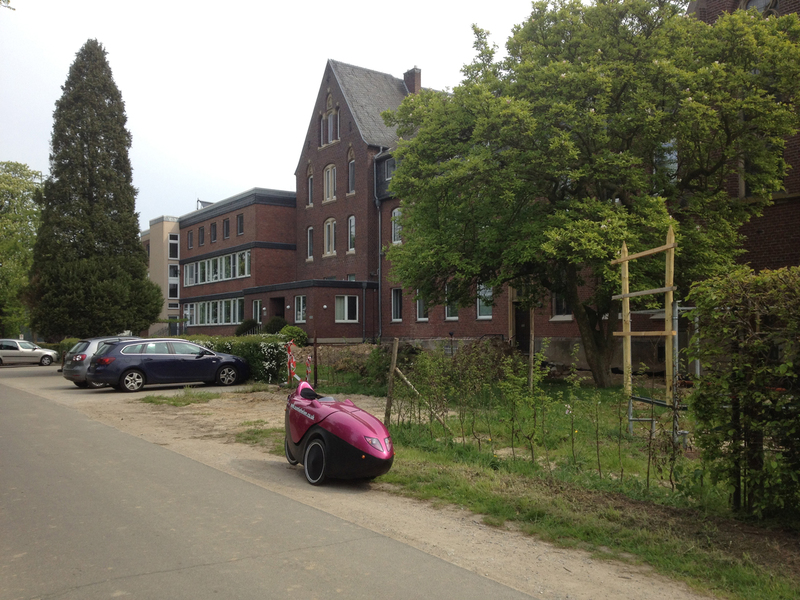 It’s a still-functioning Benedictine Convent and I did once see three nuns cycling out of a gate. 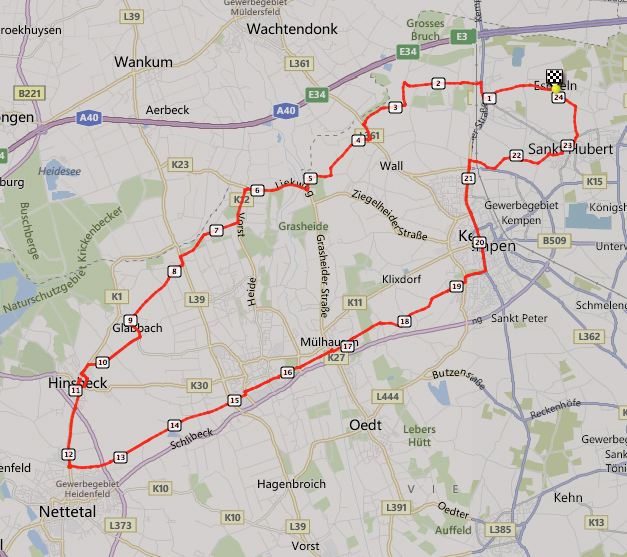 However since I’ve moved to Kempen I’ve cycled past four times and not seen anyone about at all. They seem to be having building work (I believe to create step-free access for disabled people) but there is never any sign of people doing work, just a few machines sitting idly. Although the church itself looks nice it is surrounded by some less-attractive buildings. You can stay there apparently for a retreat or quiet time and it’s nicely in the middle of nowhere so that would be rather pleasant – although there are always cyclists passing, of course! 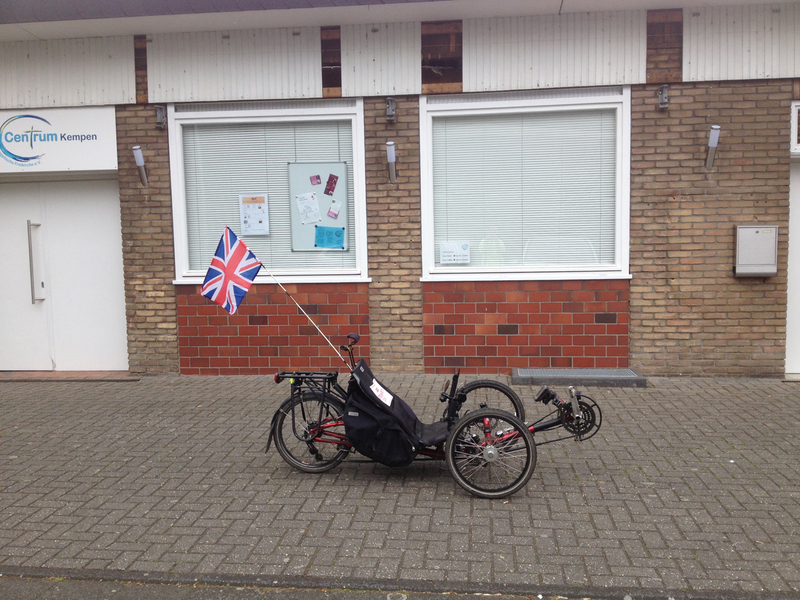 The same day that I visited Abtei Mariendonk I carried on to Hinsbeck (which is a hill!) and visited the two churches on the top of the hill. As I approached Hinsbeck it was clear to see the competition between the Catholics and the Protestants as to who had the best spire. The Catholics won! 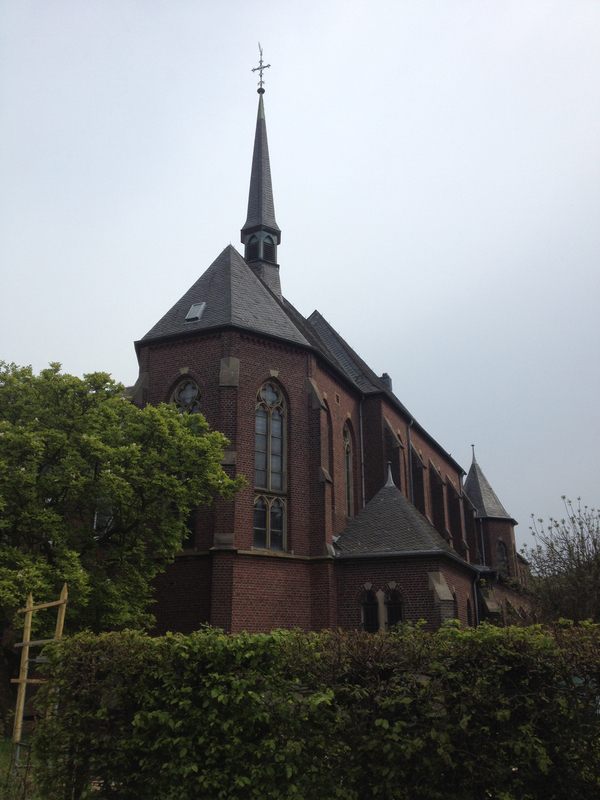 The Evangelische Kirche was tucked away in a residential part of the village. Mind you, it wasn’t exactly easy on the eye so perhaps good that it wasn’t that easy to spot! This photo was taken by some very nice people I bumped into, although they weren’t able to get the top of the church in as well. 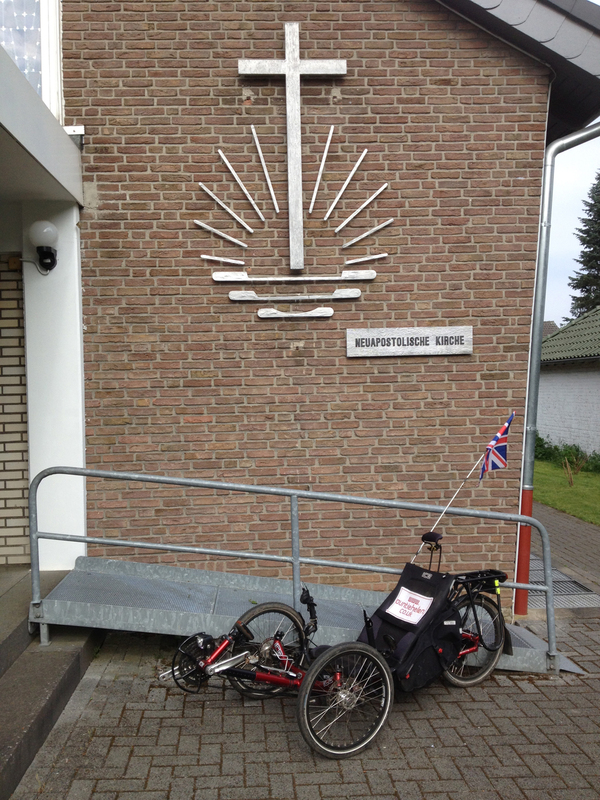 I chatted at length to these passers-by who said that the Evangelical church in Kaldenkirchen is much more attractive – I assured them that I would be seeing ’em all! This church was also closed as it was a weekday. This is the large Catholic church in Hinsbeck and its website looks like it has lots going on. It was built in 1882 and the 64 metre high steeple became a focal point of the village. However there had been a previous church on the site with aspects dating to 1441. Not only the church but most of Hinsbeck seemed closed when I visited (no bakeries open!) so I didn’t stay long but headed back. 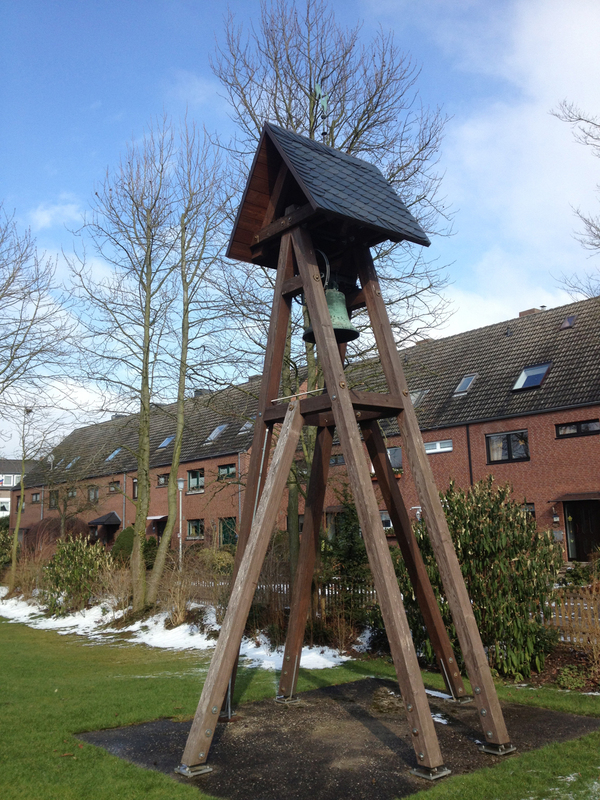 I hope you’ve enjoyed this brief look at some of the churches in Niederrhein and their variety (as well as their similarities!) Only another 102 to go!